Oakwood partners with organizations in need of development of sustained-release injectable formulations suitable for commercial use. Our expertise in development, coupled with an appropriate API can bring exceptional pharmaceutical products to patients. Oakwood uses a comprehensive approach to design and execute projects. First, Oakwood performs feasibility studies. Once the feasibility phase is complete, the project proceeds to full development and scale-up. Feasibility studies provide the first important step – determining if a partner’s API is compatible with Chroniject™. 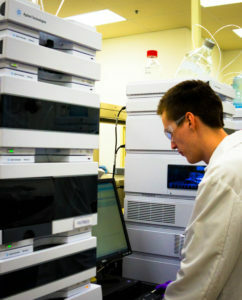 Here we determine if a molecule is compatible with our system, and if we can achieve an optimal product profile. This is a cost-efficient and timely approach. Once a feasibility study is complete, successful prototype formulations are selected for the next step: intermediate development and scale-up. Information obtained from a feasibility study provides a basis to identify, develop, and control process parameters at progressive batch scales. Process information obtained is used to identify and control critical parameters, and conditions are adjusted as needed to ensure product consistency at increasing scales. Once development and scale-up activities are complete, production of cGMP material for clinical trials can be achieved at our manufacturing facility.